Just like most festivals in January, Dinagyang is a thanksgiving for and a celebration in honor of Sr. Santo Nino. But it prides itself as a festival of excellent folk choreography, a showcase of Ilonggo heritage and culture. It is as grand as Iloilo's old churches and mansions. It is as crisp as pinasugbong saging, as delectable as pancit molo and batchoy. The religious highlight is the fluvial procession along Iloilo River. The cultural highlights are the Kasadyahan and the Ati-atihan parades and competitions. The fluvial procession is on a Friday of the Dinagyang week. Devotees carrying assorted images of the Child Jesus ride in motorized bancas from the mouth of the river towards the pier area where the foot parade would start and then back to the church. Held on a Saturday, Kasadyahan is a cultural parade. The presentation is theatrical and in local color. The Ati-atihan contest on a Sunday, is a big event. Participated in by at least twenty groups or tribe, the warriors wipe black soot all over their body and dance to the drumbeats. Primary reason for starting the Dinagyang Festival. The festival was first started to celebrate the feast of the Sto. Nino. From a parish church festivity to honor the Child Jesus, the celebration has evolved to become a religious-cultural activity. It is now a vehicle to promote Iloilo as a tourist and investment destination. Dinagyang Song. Dinagyang Song tells of how Iloilo got its name, how it was sold by the aborigines to the Borneans led by a Datu Paiburong. It also describes Ilonggos' proud heritage, industry and peaceful existence. It spells out hope and progress through Dinagyang. Responses Dinagyang has been getting from audiences and media over the years. The performances have awed audiences because of its spectacle - the choreography, costumes and music are very impressive. Especially, the choreography which has been noted by no less than the National Commission for the Culture and the Arts (NCCA). The commission has tagged Dinagyang as the "Festival of Excellent Folk Choreography". Through the years, the festival has gained national prominence and recognition by winning the national street dancing competition. 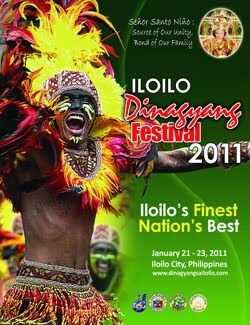 Now, people know that Dinagyang is Iloilo, and Iloilo is Dinagyang! @axl-di rin ako punta, share ko lang info sa mga followers ko... hehehe! try mo next year go to iloilo! one of the best festivals in terms of streetdancing performances.